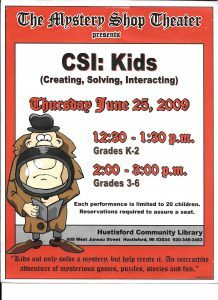 It was nine years ago today (June 25, 2009) that we performed the Grades 3-6 version of CSI: Kids (Creating, Solving, Interacting). 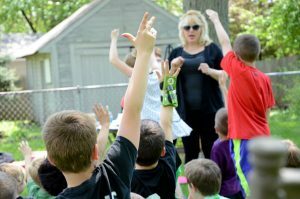 The client was Hustisford Library in Wisconsin, and it was performed by Erica Sharpe and Mary Heitert. Erica is also the playwright of this script.